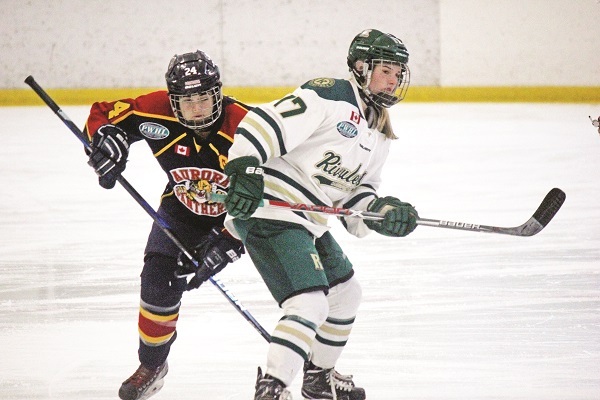 The Aurora Panthers are making moves in the Provincial Women’s Hockey League standings. The intermediate squad turned around a three-game losing streak with a pair of wins over the weekend, picking up a crucial four points to jump three spots in the PWHL rankings. A visit with the Bluewater Hawks on Saturday saw Aurora captain Emma Irwin take the reins early, notching the game’s opening goal midway through the first period. Bluewater tied it up early in the second, though Aurora keeper Caroline Pietroski was solid between the pipes the rest of the way. Jayden Thompson and Megan Morris closed out the scoring to snap the losing streak and give Aurora the 3 – 1 win. A Sunday matinee the following day had the Panthers visiting the Southwest Wildcats, where Hannah Murphy stole the show in net in stopping 21 of 22 pucks in another 3 – 1 win. Irwin once again opened the scoring, while Lauren Dabrowski and Jacey Dane found twine in the third period. The pair of wins pulls Aurora back to a .500 record in the PWHL, bringing a 6-6-1-1 record into their next action. They hit the ice with the Mississauga Jr. Chiefs (5-7-3-0) on Saturday afternoon, before returning home to the SARC on Sunday for a 1:25 p.m. puck drop with the Leaside Jr. Wildcats.